Today is day 2 of our Silhouette Week and we have some fun projects to do. If you missed yesterday, you might want to go back to watch the first set of how-to videos and to enter the giveaway HERE. .....and we'll be making this framed art with the Silhouette sketch pens. I liked the pillow so much I made another. It brings the colors of the rug up to the couch. 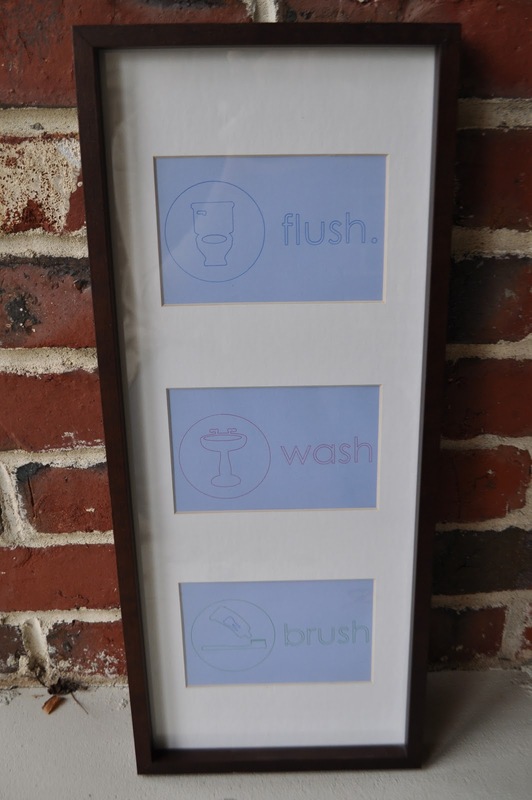 Here's how I made the framed bathroom art using Silhouettes sketch pens. This sketch pen tutorial will also give you a some practice with "grouping" and "ungrouping" shapes in the software. I played a little more with the sketch pens and made this little card as well. It quickly drew the whole thing for me. Fun, huh? There's even more Silhouette fun tomorrow. Thanks for stopping by. Hmmmm, third times a charm? Have tried a few times to post a comment and can't login. sigh. I am LOVING these tutorial posts and am so greatful to SEE a tutorial on the Silhouette, rather than read the manual. Questions: where do you buy your vinyl, fabric transfer and sketch pens? I am in Canada, so online would be best I think. Thanks so much for your blog, it has really been inspiring to me over these last 6 months! What a great tutorial! And I love your pillows, I think I need to make the notebook paper one. First off, loving the new header. Second, thank you SO much for teaching about the software! I am hoping to get a cameo soon, and by watching the videos I am much less intimidated to play with the software. I also love that you're showing us lots of the different things you can do with the machine. New look? Woowza! You are tre chic! Ooh la la! Like it! I LOVE your new header!! Cute, cute boys!!! Fun, I totally need one of those them there-- cutter machines. First off, love the header! Secondly, I made a couple t's by cutting the freezer paper with the silhouette. Now that you've tried it both ways (vinyl and freezer paper) which would you say is easier/more cost effective? Also, I've been wanting to cut some fabric using my silhouette but I'm wondering if I could just use my heat n bond for the interfacing. What do you think? Thanks so much for the tutorials. I love the ideas right before christmas. It should make handmade holidays much simpler! I have the same questions as the lady above and one more :) you have three different colors with the sketch pins did you just have it do one image at a time and then change the pin? how did you get it to just sketch the one when all three are showing on your screen? Let me answer your questions guys. momof2under3: Honestly, I think the freezer paper is much more cost effective. If the stencil from the fabric kit would transfer easily with the transfer tape I would say it's easier than freezer paper, but I didn't have such luck. I'll probably stick with the freezer paper. Also, YES you can use regular heat ' n bond. It's the same. The Hoffers: You are very observant :) I copied each finished image to a different page/project. I loaded each one as if it were a new project and switched the pens. I made sure they were in different spots on each page so that they wouldn't over lap and I could use one piece of paper. Does all that make sense? So I had three projects open essentially and I did them each separately, but using the same paper. can you please do me a favor and have more little men in your videos, absolutely priceless! Great tutorials. I love that Rex was in there. What an absolute doll. I hope I can come back and use your tutorials one day! These are wonderful ideas! Oh maybe someday I'll get a silhouette, wouldn't that be wonderful? I tell myself. And I love your new header and self photo. You are so gorgeous! I'd love to know how you made the other notebook pillow. Cute ideas! Oh my word, I love the pillows!! It would be fabulous to have this machine. I could bring my crafting into this century! I just tried out my sketch pens a few weeks ago and love them! Those things are amazing. Do you ever find yourself just stopping and watching the machine work...maybe that's just me! I am going to have to start making a list of all the cute things I would make. We are also looking for a house. What a great way to spruce it up and make it a home :) Hope that I'm the lucky winner!! I have been drooling over your ideas and projects for months....if only I had a silhouette! I find myself drawing and cutting by hand with a lot of projects like these. As a mom of two, this could save me a ton of time!! I would LOVE to have one of my own! Just wanted to thank you for doing the tutorials on the Silhouette. I just recently bought a Silhouette SD and felt like I had gone through it fairly thoroughly, but I still have learned from your tutorials. Thank you a bunch! Also, really enjoyed seeing how the printables are done. I always wondered. ;-) Have a good weekend! Your my Friday night entertainment! I finally got my Silhouette loaded to my new computer! School's in session, thanks teach! Hey, You probably already know this but just a quick little pointer for you with Grouping and ungrouping... You can (at least with windows 7) do a drag box around all of the separate pieces that make up one image which will select them all instead of having to click on each little piece like you did in the video. You can even do this when the larger images are close to each other. Like when your toilet and tub were close together. I hope that all made sense. Hi - i just got my silhouette cameo - i am so excited to get makin'! 1, can i use the shelf liner clear contact paper/vinyl to make the stencils? if i cut it down to the 12x12 size so it fits the mat? and 2, do you know how to make the mat not so awfully sticky? it ate my paper, and took for e v e r to clean off - like, way too long! 3, (one more) on using the heat and bond, and cutting - what depth for the blade, and am i correct in thinking you should not take the paper backing off of the fabric until after it's cut? I find your tutorials to be wonderful, and have followed you for a while now - thanks for taking the time to make them, you rock!! I love your orange rug with the pop of aqua! Where did you find that? It's from Target a couple of years ago, but they might still carry it. I'm not sure.